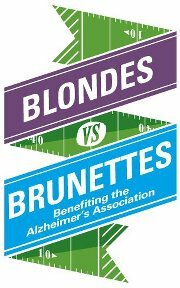 We’re officially only one day away from the big game – The Blondes vs. The Brunettes. All of our hard work, including on our touchdown dances, is coming to this moment. On behalf of Team Blonde, I wanna give a big shout-out to our coaches for giving up their time to hang out with us Blondes and help us prep for the game. Also to my awesome teammates – this has been such a great experience getting to meet other young professionals in Cleveland and I’m looking forward to keeping in touch with each of you (and dominating again next year). I promise there will be recap of the game as soon as possible. But, of course, we have to remember what this is all about. Raising money for the Alzheimer’s Association. And both the Blondes and Brunettes put together an A+ effort to raise money. I’ve had friends participate in other cities in BvB and raise about $15,000-$20,000. But, we in Cleveland, stepped up. As of tonight when I checked BvB, we’ve raised close to $35,000 – far exceeding our original goal. And there’s still time for you to join in and help us keep bringing in the dolla bills. Make a donation here online or join us on Saturday at the big game. What: Cheer on your favorite team as Blondes battle Brunettes on the gridiron, followed by a Victory Party where everyone can join in the fun! Victory Party: All game day attendees will receive a FREE drink ticket to celebrate with our players and coaches after the game at Becky’s Bar and Grill (across the street). A portion of all food and drink sales will be donated by Becky’s to BvBCLE. Disclaimer: I’m an official BvBCLE Blogger and participating on Team Blonde (my natural and current hair color). As part of Team Blonde, I’m required to attend four practice (check) and raise $250 (check) toward our goal of $25,000. While I’ve reached my goal, I’d love for you to continue to support me in the fight against Alzheimer’s Association. All opinions are 100% my own.